veganized a chocolate sauerkraut cake which is a common recipe found on dozens of recipe sites. I decorated it from inspiration derived from Mirabel Catering . The instructions for the leaves was adapted from here. 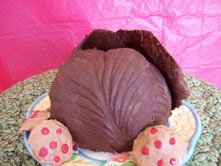 At least one day before you assemble the cake make the chocolate cabbage leaves. You will need 1 or 2 heads of cabbage for best selection of outer leaves. Cut off about 8 to 10 perfect cabbage leaves wipe both sides with a dry cloth. Don't use water (and soap) to clean the leaves; the oil of the leaves will be removed and will make peeling the chocolate difficult. You may want to trim the thick vein running up the back of the leaf so it will not be too thick. Set leaves aside. Melt about 1 cup of dark or semi-sweet chocolate chips over hot water in double boiler or bowl set in pan of simmering water. Make sure no water splashes in the chocolate. When chocolate chips are just about melted stir until smooth. Turn heat down just enough to keep the chocolate liquid. Line several cookie sheets or trays with waxed paper. Prepare one cabbage leaf at a time. Using a pastry brush or the back of a spoon, spread a layer of chocolate on the inside of each cabbage leaf making sure the edges are coated. Make sure to spread a thick coat over the larger veins, especially the one running down the middle of the leaf; otherwise, the leaf will crack. Place leaf in freezer leaves for about 3 to 5 minutes to quickly solidify the chocolate. Remove and inspect the chocolate leaves. If any veins are exposed, them recoat them with more melted chocolate to cover them; freeze them again in the same manner. This side of the leaf does not have to look neat. the rest of the leaves. If a chocolate leaf breaks just pop it back in the bowl and remelt. Store leaves in refrigerator until ready to assemble cake. First, turn the sauerkraut into a strainer and rinse it thoroughly. Allow it to drain well. Cut sauerkraut finely into small pieces with a knife. Rinse again and let sit in strainer until ready to use. Preheat oven to 350 degrees F. Grease and line with strips of waxed paper two 6 or 7-inch oven proof bowls. If you have only one bowl, bake one cake layer and then clean the bowl and bake the second half. Cream margarine until light and fluffy, add sugar and beat until well blended. Beat in egg replacer and vanilla. Sift together the dry ingredients, then add alternately with the soy milk to the creamed mixture. Using your hands, squeeze the excess water from the sauerkraut, measure it and carefully stir into the cake, mixing thoroughly. Fill each prepared bowl about 1/3 full and bake 30-35 minutes in 350 degree F. oven or until middle is baked. Test with cake tester or toothpick. If cake is still not baked after 35 minutes lower oven temperature to 300 degrees and bake another 10 minutes or until done. Remove from oven and cool 10 minutes. Turn cakes out on cake rack, peel waxed paper off, and cool thoroughly. Bake remaining batter into cupcakes and freeze for a treat another day. Make chocolate cream frosting while cake is cooling. You will putting both cakes together to make a sphere shaped cake like a cabbage. Slice each cake in half horizontally to make 4 layers all together (2 layers from each cake). Place one of the small layers cut side up on the plate you will use to serve cake and cover with about 1/4 cup of frosting, top with next layer and repeat until you have four layers stacked in a sphere. Frost all around the cake. Layer the outside of the cake with the chocolate cabbage leaves to resemble a real cabbage. Refrigerate cake until ready to serve. Cover loosely with waxed paper or plastic wrap. For a 2 layer cake: Bake in two greased and floured 8" square or 9" round cake pans which have been lined with waxed paper. Bake at 350 degrees F. for 30 minutes or until cake tests done. Allow to cool on rack for 10 minutes, then turn out, peel off paper and finish cooling. Fill and frost with your favorite icing.